Off The Hook Classic Slot Guide & Review - Casino Answers! 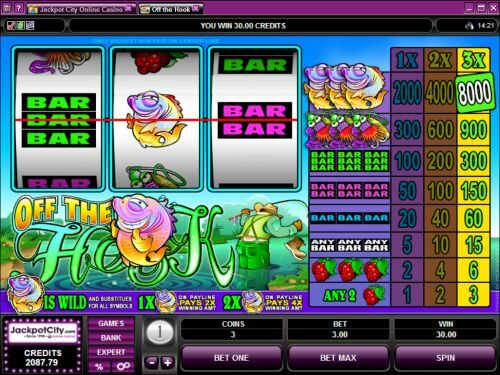 Off the Hook is a 3-reel, 1-line classic slot machine developed by Microgaming, featuring a wild symbol and multipliers. You can play the Off the Hook classic slot machine at Bovada. Coin sizes on the Off the Hook slot machine are $0.25, $0.50, $1, $2, $5 and $10. You can bet 1-3 coins on the Off the Hook classic slot. The lowest bet you can play on the Off the Hook slot game is a quarter per spin. The highest total bet you can make on the Off the Hook online slot is $30 per spin. This is a decent betting range for a classic slot, enough so that both casual players and high rollers should be satisfied. To select your bet, use the “Bet One” button and hit “Play” to spin the reels. To play all 3 coins on Off the Hook, hit the “Bet Max” button. The highest paying symbol on the Off the Hook slot machine is the Fish symbol. If you hit 3 Fish symbols on the payline, you will win the 8000 coin top jackpot. The Fish symbol is wild and substitutes for all symbols. 1 or 2 Fish symbols will multiply your winnings by 2X or 4X when substituting for other symbols. Use the Fish wild symbol to win big on the Off the Hook slot game at Bovada! There are 8 winning combinations on the Off the Hook classic slot machine. The complete payout schedule is as follows (1/2/3 coin payouts in parenthesis): 2 Berry symbols (1/2/3), 3 Berry symbols (2/4/6), any 3 Bar symbols (5/10/15), 3 Single Bar symbols (20/40/60), 3 Double Bar symbols (500/100/150), 3 Triple Bar symbols (100/200/300), 3 Bait symbols (300/600/900) and 3 Fish symbols (2000/4000/8000). Hit “Expert” to access Off the Hook’s autoplay mode where you can play 5 or 10 autoplay spins or hit the “Auto Play” button to open up advanced settings. You can set the number of spins (5, 10, 25, 50, 100, 250 and 500), number of seconds between spins (0, 0.25, 0.50, 0.80 and 1.50), stop once all spins are complete, stop when jackpot is won, stop if a win exceeds or equals ($25, $50, $100, $250, $500, $1000 and $2500), stop on any win and stop if credits increase/decrease by ($25, $50, $100, $250, $500, $1000 and $2500). You can stop autoplay at any time. Off the Hook is a good classic slot from Microgaming, especially for the fishermen and fans of fishing out there. There’s nothing like a nice relaxing day out on the water and you can get a similar feeling at home with the Off the Hook classic slot when you play at Bovada. Can USA players play the Off the Hook slot machine for real money? Unfortunately, American players cannot play the Off the Hook slot game for real money at this time. For a video slot with a fishing bonus game, we recommend you play Olympic Slots at Bovada Casino. Where can I find more sports themed slot games? For more sports slot games, including fishing, baseball, basketball, football, hockey, soccer, racing and everything inbetween, please read our list of sports-themed online slots. Can I play a free Flash game of the Off the Hook classic slot? Yes, you can find Off the Hook at the Instant Play casinos at Bovada. You can play for free or real money without even downloading any casino software. If you experience any issues with the Flash software, make sure you have the latest version of Adobe Flash Player.